TMNT: Out of Shadows is the latest in a long line of ninja turtle video games, currently in development from Red Fly Studios. 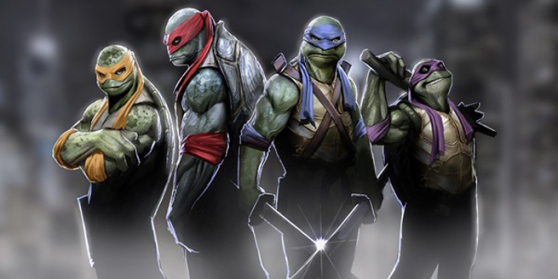 After a slew of thoroughly underwhelming showings for the four Testudine heroes, aka anything after Turtles in Time and Tournament Warriors on the SNES, could TMNT: Out of the Shadows be the game to turn the franchise around? Unfortunately I can’t make a very good judgement call at this point because there’s very very little information out on the game. If I go with my gut I’ll say yes, this is gonna be a great turtles experience. The graphics look phenomenal, combat looks just varied enough that I’m tempted to say “deep,” and the videos almost ooze fun (see what I did there?). But Red Fly only has a TMNT Facebook page and a Youtube Channel. That’s it, which is weird when you consider the game is coming out, supposedly, at the end of this month. I would love to see some gameplay breakdowns, character tutorials, mechanics explanations, a little something, but the best that’s out there is a five minute IGN video that does some in-depth analysis of the pre-alpha build and a little article from thesixthaxis. Beggars can’t be choosers I guess. Check out the video below. There’s a weapon attack button, a kick button, and special moves that are performed with the right stick according to that video. I wonder if the special moves are tied in any way to a “meter” system. That’s the fighting gamer in me talking. There’s no HUD present in any of the videos, so it’s not clear if the special moves will be available at all times (I hope), contextual, or meter-dependent. I’d be willing to bet that because this is a downloadable title aimed at what I assume to be a very broad audience, the special moves will be available any time, which should spice up the ninja action nicely. The fact that the turtles play differently excites me, though I’m surprised that Donatello does the most damage, is the slowest, and has the longest range. If we think about it, I suppose we could liken him to Astaroth in SoulCalibur. Sick range, tons of power, slightly slower than the rest of the cast. If anything I assumed that Raph was going to be doing the most damage, especially since he needs to get in close to put the hurt on. Wait, lemme stop there. 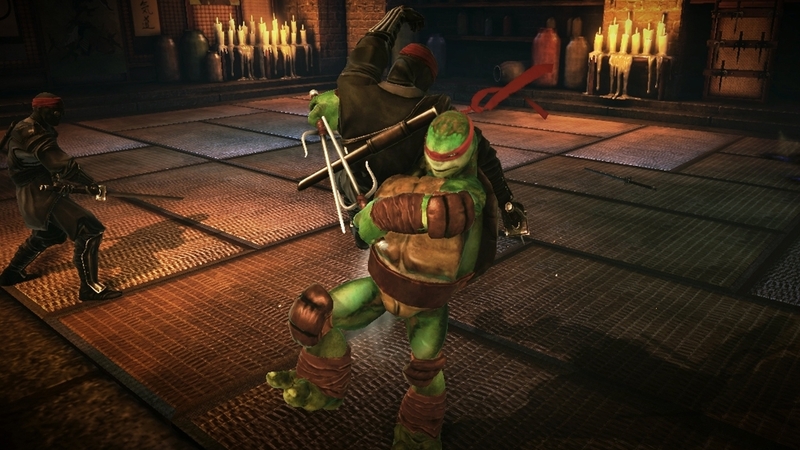 I’ll be talking a little more about each turtle’s trailer in subsequent posts, so for now I just want to say I’m pleased that each of our green ninjas has their own unique fighting style. Getting down to the nitty gritty mechanics stuff, you’ll notice that the turtles can block, hard to tell with all that action going on, but they can and that makes me happy. Those fights can get pretty hairy, with a veritable host of enemies ready to thwomp on our lovable reptiles, and if there wasn’t a way to block, dodge, or parry… But the brothers can leap and tumble around foes as well as block, so I think we’re set. The heroes in half shells can also perform team attacks. You’ll notice Donatello swinging Mikey around at the end of his staff, Mikey ducking down so that Leo can trip up one of the foot, and an awesome little ode to the live-action movies with a quadruple team shell slam. I’m going to go out on a limb and say that there’s gotta be at least some cool down on those team attacks, otherwise what’s to keep players from spamming them all day? 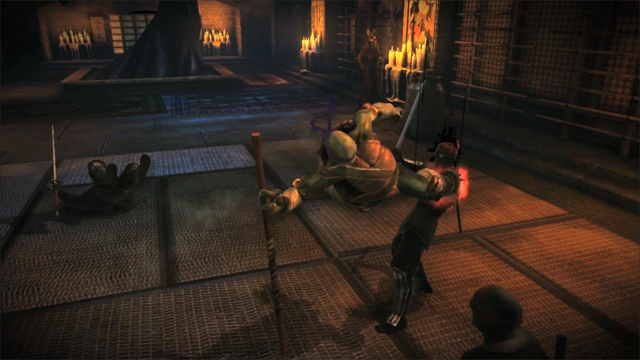 Donatello teamed with anyone could create a whirlwind of pain with insane range, turning the game into an easy mode mash fest. No doubt tons of fun for you and up to three friends, but I wonder, because the game seems to be all about four turtles at a time, will be an option to just play on your lonesome? As in just one turtle on the screen? The combo system looks, right now, very fluid and fun and I don’t necessarily want to worry about AI controlled teammates messing up my combo flow. The Sixthaxis Article likens the combat system to the Batman: Arkham series, and if that’s the case consider me hyped. That system was so ridiculously simple, and yet ludicrously difficult to master, and if this game provides even half the fun I had whomping on thugs as the caped crusader I’ll consider it a success. And that’s it for now. Check back for individual character breakdowns in the next couple of days, but until then, stay classy errybody!